Nancy Wilkerson with Strutin For Jackie. All photos courtesy of Courtesy Promotions for WPSS. The final two Western Pleasure Super Sires classes have concluded at the 2018 Tom Powers Futurity. 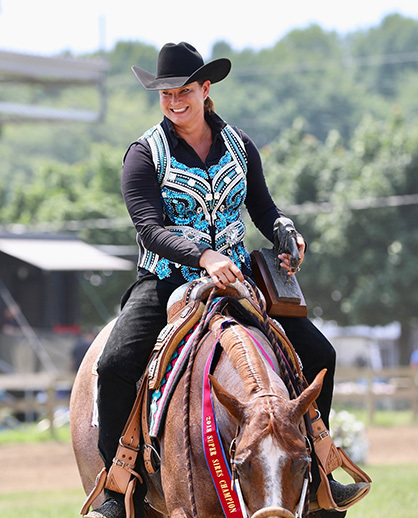 In the 3-Year-Old Limited Non Pro Western Pleasure, Rebecca Smiecinski rode Touch Me Touch Me, a mare by A Touch of Sudden and out of Ms Flashy Chip to win a $10,000 check. 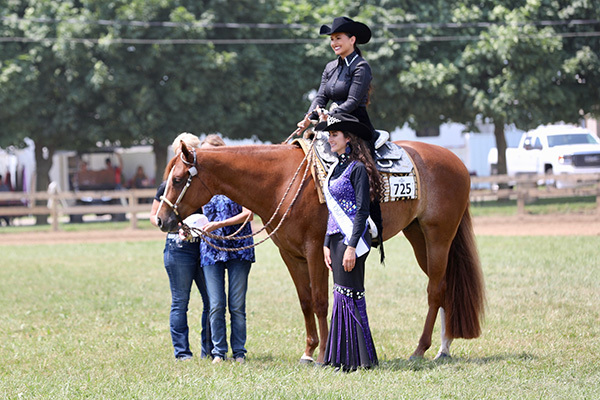 The Reserve Champion was Teresa Balkcum with Love The One Ur With, a mare by Blazing Hot and out of Present Yor Invitation. The pair earned $2,048. 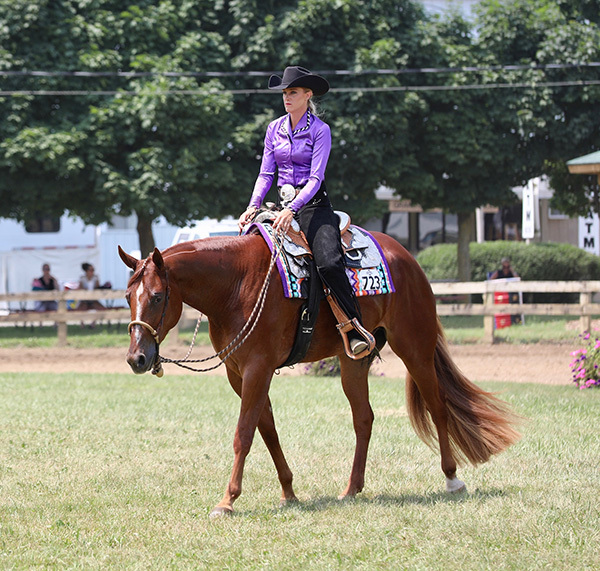 Third was was Alyssa Luckhardt with SST Cotton Candy, a mare by Nite Moves and out of Lopins Dream. The team earned $1,408 plus a $500 color bonus. 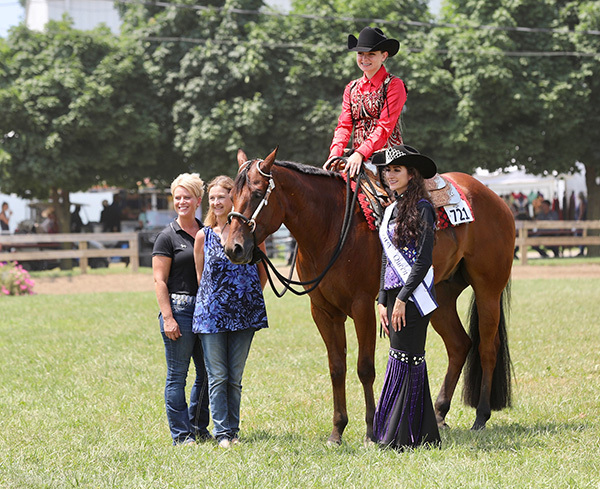 Fourth was Allison Bowen with Just A Touch To Much, a gelding by A Touch Of Sudden and out of Anita Good Bar. 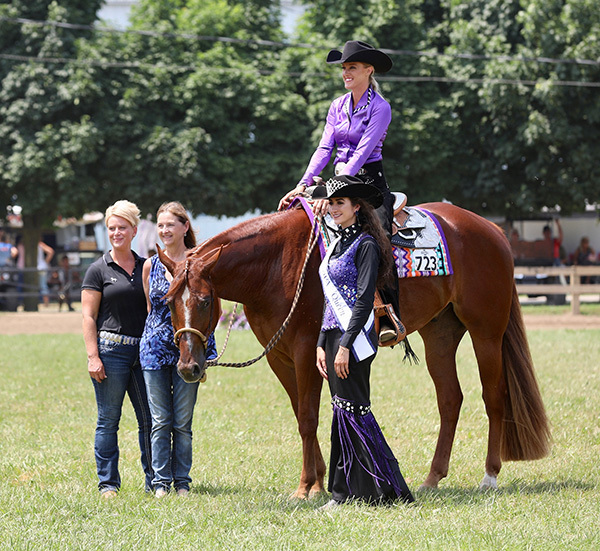 They received $1,216 for the win plus a $500 novice bonus. 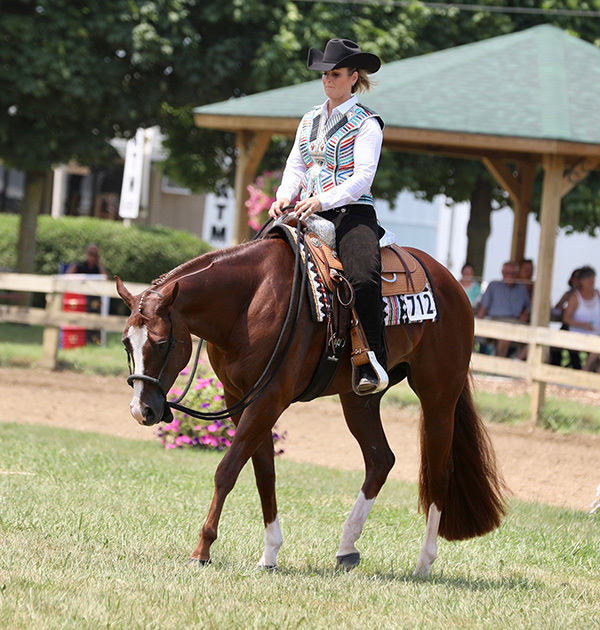 Fifth was Hannah More with Talkinboutonite, a mare by Nite Moves and out of Weretalkinradical. They received $640. 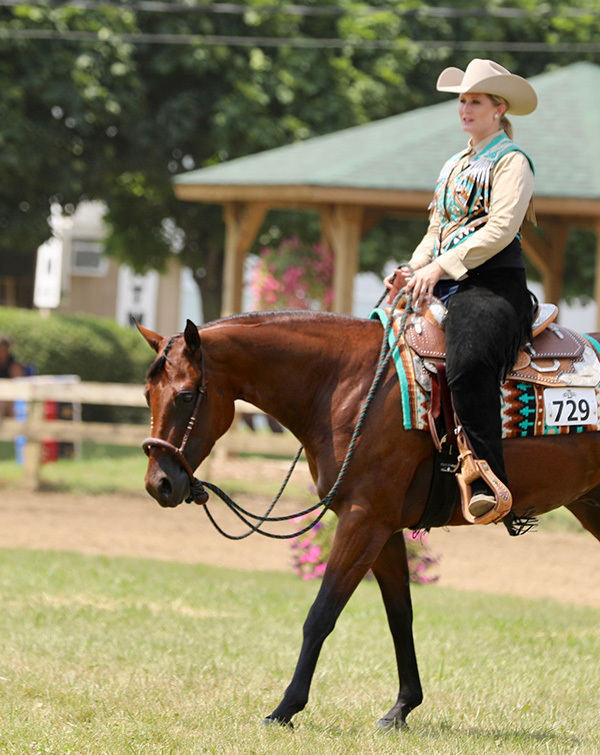 Sixth was Ruth Pottner with Looking Presidential, a stallion by Presidential Order and out of Flashy Looking Lady. They received $576. 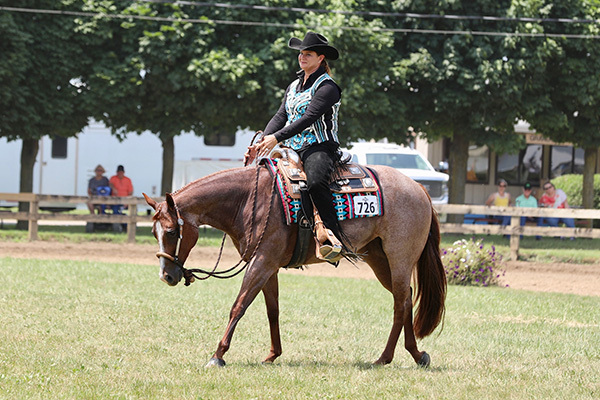 Seventh was Lisa Krueger with Extremely Hot Cowgirl, a mare by Extremely Hot Chips and out of Hunters Cowgirl. They received $512, plus a $500 homebred bonus. The total class payout was $19,400. 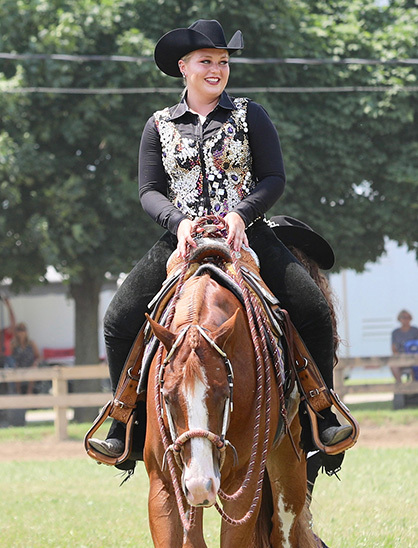 In the 3-Year-Old Non Pro Open Western Pleasure, Nancy Wilkerson rode Strutin For Jackie, a mare by Strutin On The Range and out of Zip Your Jacket to win $10,000. 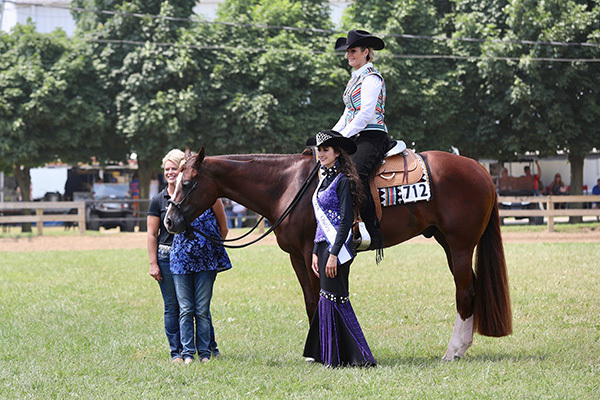 The Reserve Champion was Deanna Green with Good Vibes, a gelding by VS Code Blue and out of Goodness Gracious Me. They received $2,048. 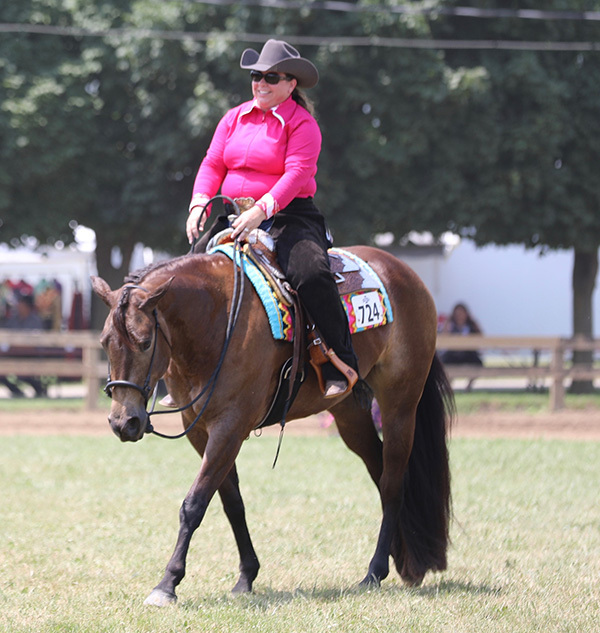 Third place was Carrie Oakley with Dew Not Touch, a gelding by A Touch Of Sudden and out of Radical Roxanne. They received $1,408 plus a $500 homebred bonus. Fourth was Mallory Menard was Just Plain Sleepy, a gelding by Too Sleepy To Zip and out of Im Already Invited. They received $1,216. Fifth was Katsy Leeman with Story Starts Again by How Bout This Cowboy. They received $640. 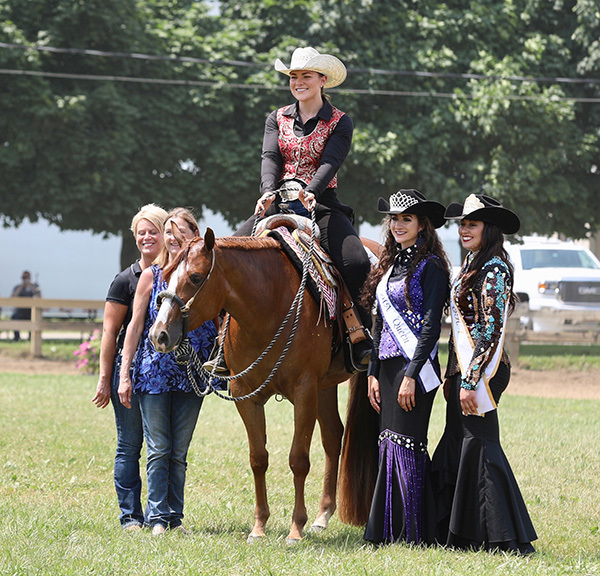 Sixth was Sophie Erpelding with One Investment, a gelding by One N Only and out of Good Invested Miss. They received $576. 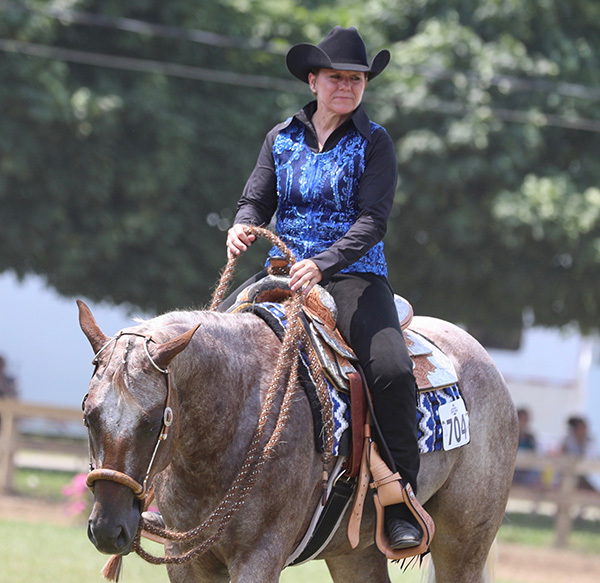 Seventh was Amanda Bell with Nobody To Blame, a mare by Blazing Hot and out of Zip In Trouble. They received $512 plus a $1,500 limited bonus. The total class payout was $20,400. 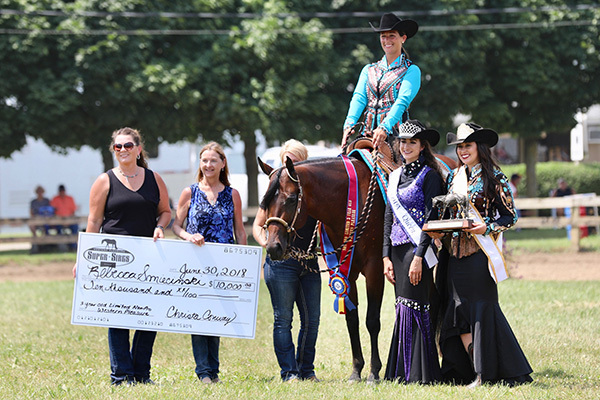 Each class Champion received $10,000, $750 towards a Wenger Leather Works saddle of their choice, Rowdy Silver trophy buckle, $500 Nutrena Feed, Rod Patrick Boots, and an NSBA trophy. 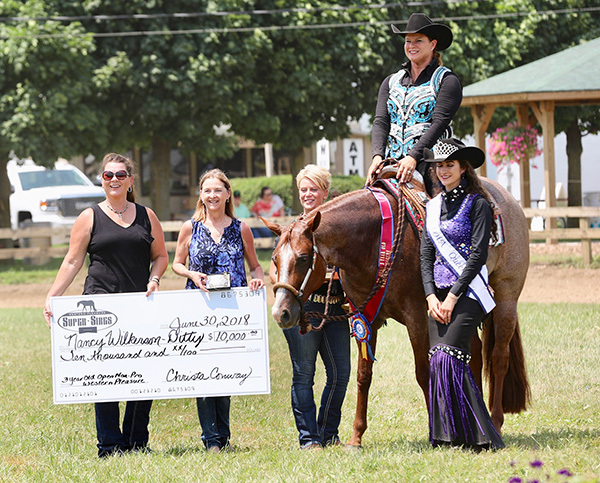 The Yearling Longe Line Champion received a $5,000 check, a Harris Leather show halter, Rowdy Silver trophy buckle, $500 Nutrena Feed, Rod Patrick Boots, and an NSBA trophy. 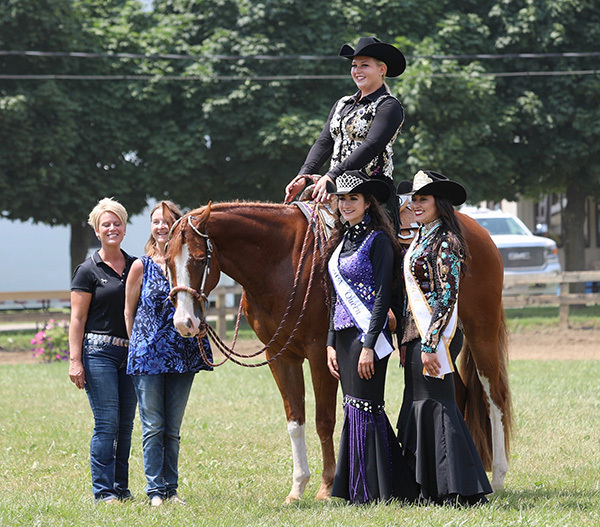 The Yearling Longe Line Reserve Champion received a Rowdy Silver trophy buckle. In 2018, WPSS has paid out over $63,000. That brings the overall total up to over $386,000. The WPSS Super Sire of the Year is VS Code Blue. The second place stallion is A Touch of Sudden. Third is The Rock. Fourth is How Bout This Cowboy. Fifth is Nite Moves. 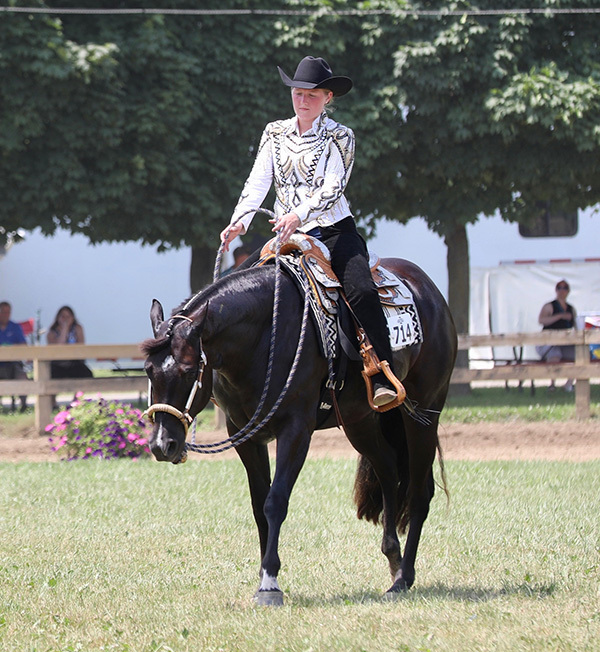 For more information about the WPSS program, visit westernpleasuresupersires.com. 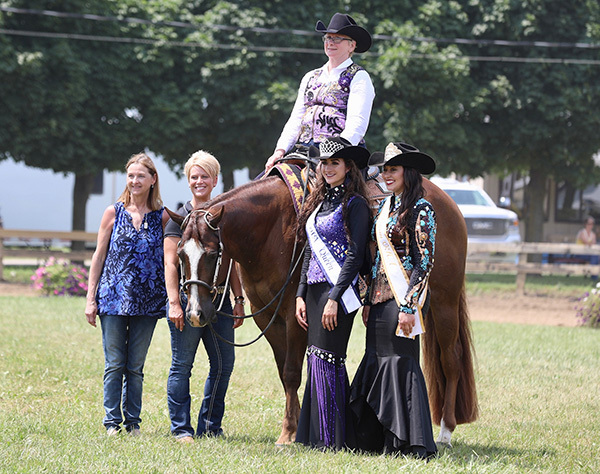 WPSS would like to thank the following sponsors: The Equine Chronicle, Tom Powers, Nutrena, Pulse Vet, Wenger Leather Workd, Rowdy Silver Buckles, Rod Patrick Boots, Harris Leather, Owl Manor Veterinary, Marrita Black, and Courtsey Promotions. Scroll below for more great photos from Courtsey Promotions for WPSS.